The next step is understanding your buyer’s journey. 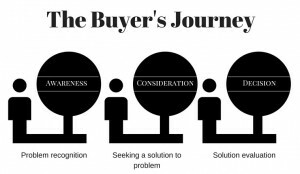 This is the process that a buyer goes through when leading to a purchasing decision. This journey has three distinct stages known as awareness, consideration and decision. You will map content to each stage of this journey. You will develop you content’s purpose, format and topic according to eachstage in the buying journey and profile of your buyer. 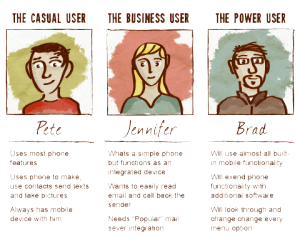 You need to make it easy for your buyer to consume your content. You will also create content that is educational as opposed to promotional. 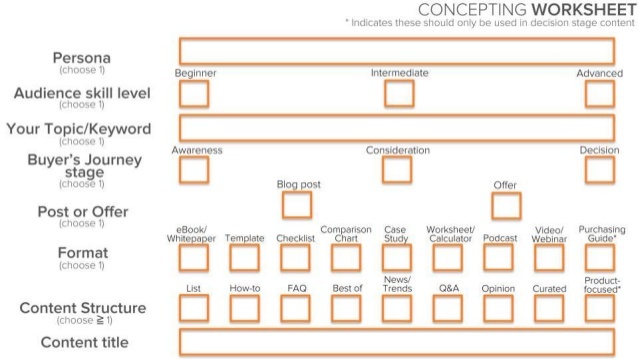 As seen here in Hubspots concept worksheet, content like purchasing guides and product focused material should only be used for ‘decision stage’ content. You will spend as much time thinking about how and when you will distribute your content as you did creating it and make sure your content is optimised for the web. Distribution methods include social media platforms, landing pages, email marketing and blogging platforms. Once your content is out there, you now need to analyse the results of your efforts. You will want to check the number of visits, the number of shares and performance of the content by author, topic and format. Creating a content marketing strategy from Hubspot, gives further detail on this process. Creating content with a plan will help you understand what is worth repeating. Engaging web content is all about knowing your audience, creating content to attract the right people, and encourage those people to revisit your website for further engagement and promotion. Get content and web marketing solutions straight to your inbox!